"This series will tell the amazing stories of inspiring people who have made a difference and changed the world, despite the odds stacked against them. They will detail the characters' humble origins, the obstacles standing in their way that had to be overcome, and discuss the successes and achievements for which they are lauded today. 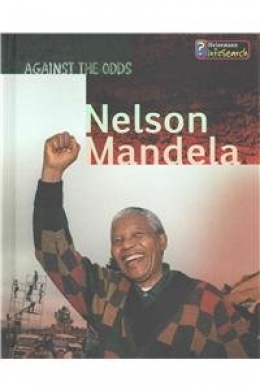 This book tells the story of Nelson Mandela, who became South Africa's first black President and helped to end apartheid despite the opposition of the white Afrikaner government" -- Provided by the publisher. What was Mandela's upbringing like? -- How did Mandela get into politics? -- How did Mandela campaign against apartheid? -- How did Mandela lead the ANC from prison? -- How did the anti-apartheid movement force change? -- How did Mandela help to end apartheid? -- Continuing Mandela's work. 48 pages : color illustrations, maps ; 26 cm. Mandela, Nelson, 1918-2013 -- Juvenile literature. Presidents -- Biography -- Juvenile literature.